Can You Master This New Beer Relay Race? 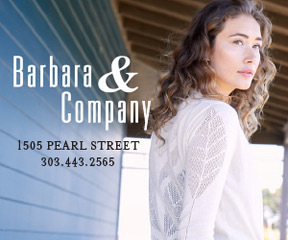 Join our mailing list for more great content like this! 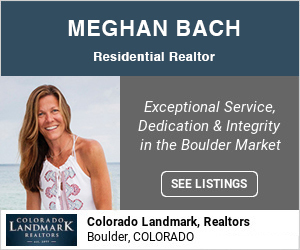 This is so Boulder that it’s built into a boulder. This home is constructed on a cliff atop Mount Sanitas with ridiculous, panoramic canyon views. The home actually has a rock outcrop carved into the interior, so there are rock features from outside incorporated inside. Imagine a massive wall of boulders in the living room and the mountainside forming one wall in the shower. You have to see it to believe it. Stay on the top floor of a “treehouse castle” just five minutes from Pearl Street. The space is artistic and eclectic, yet clean and organized. Features include a double shower in the bathroom, travel amenities, Apple TV and wifi, laundry, a spring water dispenser, fireplace, decks, hot tub, gardens, a stream and private park, easy access to trails and a lake. You can even rent cruiser bikes and camping/hiking gear. One catch: No pets allowed, unless it’s a panda bear. 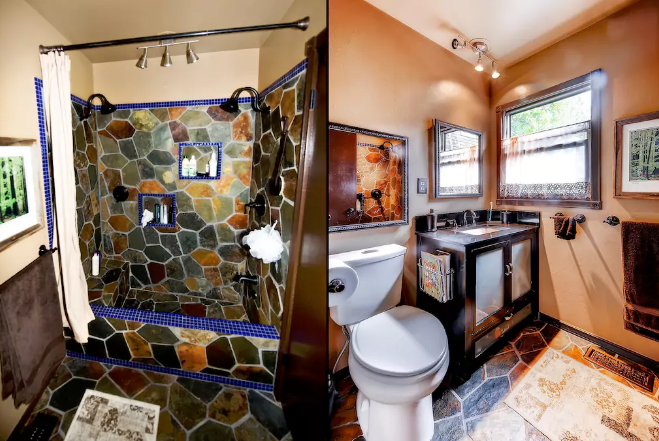 This beautiful mountain home has some of the features of your own private spa, including a steam shower and jet tub. After your soak, relax by the fireplace or on the south-facing deck with a view of Boulder. This studio has a private garden, mini fridge and coffee maker. But it also has a hammock and a private arcade. This guest house in the quirky, colorful Prospect neighborhood in Longmont promises to be “nicer than any hotel.” Prospect is a cool day trip from Boulder, with its own art gallery, shopping, restaurants and parks. Note: This property is about 25 minutes from Boulder, but the mountain views from certain angles won’t disappoint. Plus, Prospect is a unique community, in and of itself, and claims to be Colorado’s first New Urbanism neighborhood. The Chautauqua Park cottages are highly sought-after places to stay and can fill up in the summer. That’s when this guest suite would be ideal. This home offers a suite with a separate entrance with a kitchenette and living space, plus easy access to the beloved Chautauqua green and trails and cozy, outdoor sitting areas. You can also rent out full houses in Boulder, like this luxurious, six-bedroom property near downtown. Guests here can use the hot tub, garden, multiple decks, multiple grills and more. 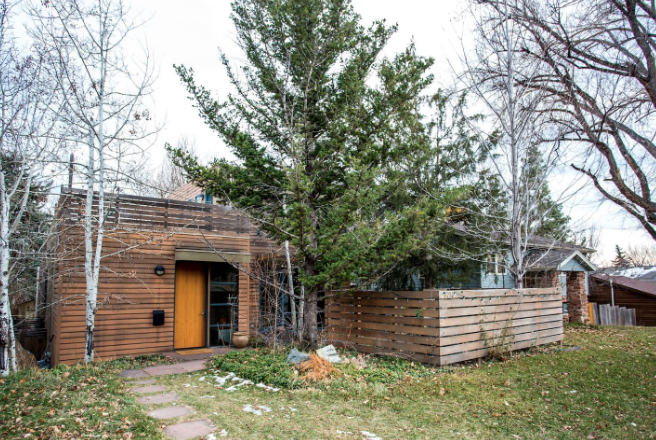 The unusual-looking Barrett House was designed by respected Colorado architect, Charles Haertling, for the artist Clotilde Barrett (hence the name). Now, you can stay in this 3,000-square-foot, mountainside wonderland. 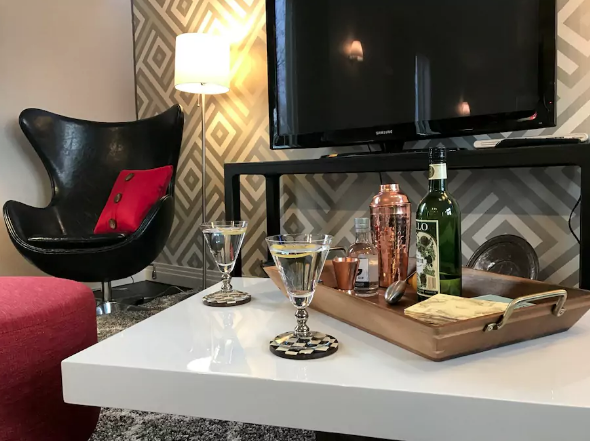 Highlights include cork flooring, rugs made out of recycled plastic, mountain views, a cast-iron fireplace, eclectic decorations, skylights, a theater room with an 80-inch screen, a “Mad Men”-inspired bar and its own art installation. 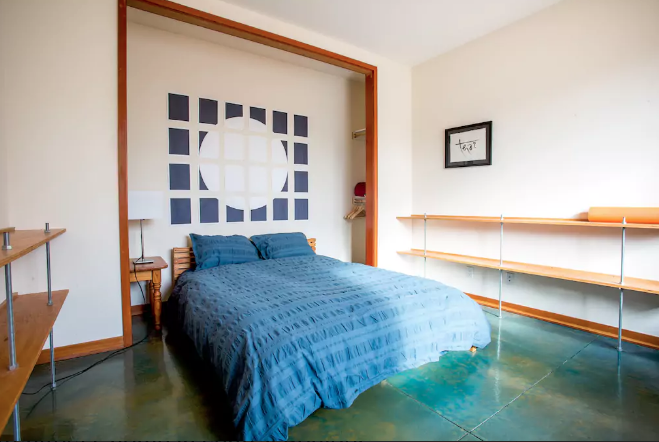 This Boulder home for short-term rent is the home of an architect, and you can feel that in the clean, Japanese design. Outside, there are decks, including an oversized rooftop deck. Inside, there’s a game room with a ping-pong table. What!!! You missed the best one! 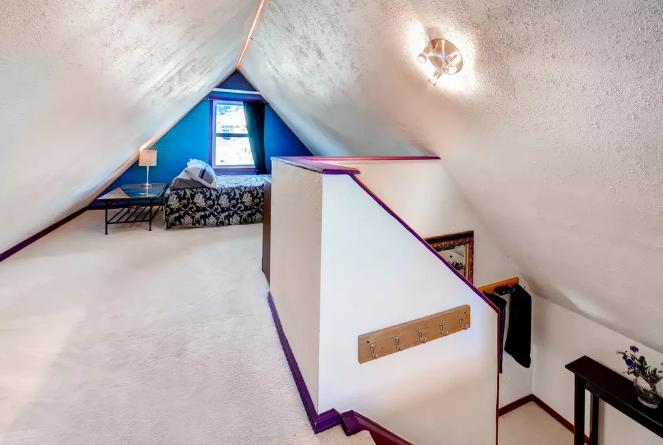 The 420 friendly mid century Rock and Roll themed Airbnb right in downtown Boulder in a 7 story Castle! Miss Patty is a super host and had the very best reviews!! Please add the River House Mystere School Airbnb. Good friend of mine runs it. 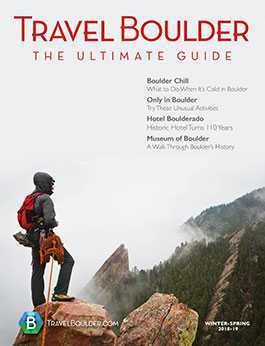 Get your copy at Chautauqua, the Downtown Boulder Visitor Info Center, the Boulder Chamber Center, local hotels and multiple other locations across Boulder County.